Our searchable database of public employees' pay — now featuring data from universities and eight of the state's largest cities. The payroll database contains more than $250,000 public employees' salaries. San Antonio City Manager Sheryl Sculley is the highest-paid big-city employee in Texas, making $315,000 annually. The runner-up? Her counterpart in Dallas — City Manager Mary Suhm, who makes $278,460, according to that city's records, now available in a searchable Texas Tribune database of public employee salaries. But they're relative laggards when you look at state-level salaries, particularly in the major university systems. At the state government level, the top salaries go to investment people at the Teacher Retirement System, the Employee Retirement System, and the state treasury, which is part of the Comptroller's office. TRS and ERS together, for example, have 13 people making $200k a year or more — five of them making $300k or more. The top guy is Thomas Harris, the chief investment officer at TRS, whose base salary is $480,000. 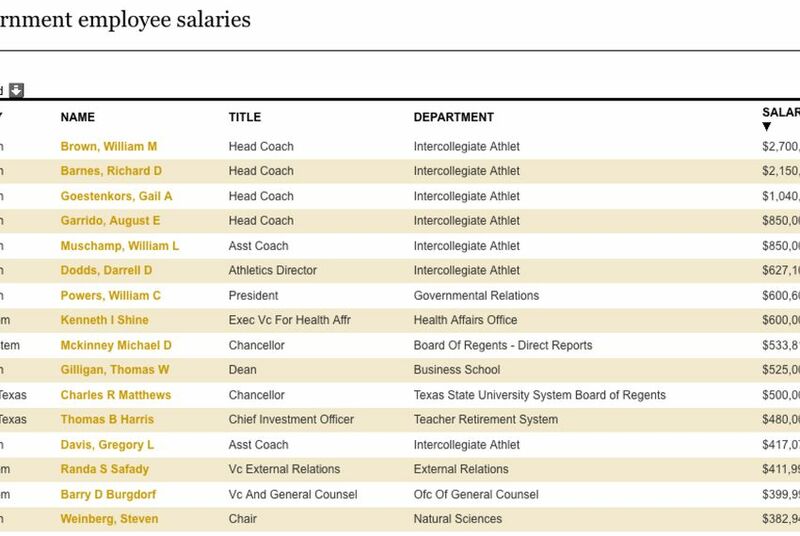 The top five earners at the University of Texas are coaches: Mack Brown, $2.7 million; Rick Barnes, $2.15 million; Gail Goestenkors, $1.04 million; and Augie Guarrido and Will Muschamp, both at $850,000. The general line: Universities pay more than the state, the retirement agencies, with their need for high-priced investment folk, are next. The state's next, then cities. The numbers come from the cities themselves and are now compiled, along with the compensation of state employees, in a searchable Texas Tribune database. It includes state payroll records as well as data from Houston, Dallas, San Antonio, Austin, Fort Worth, and El Paso. Austin's pay for its top 20 employees, at $3.7 million, is highest of the six cities, just a bit ahead of Dallas, and followed by Houston and San Antonio, at $3.5 million each, and El Paso and Fort Worth, at $3.3 million each. The average top employee in Austin makes $185,541 annually. The average top employee in Fort Worth makes $163,999. Taken together, the top employees in the state's six largest cities pull down an average of $174,850. The database includes salary information for employees of those cities, and of the state. It also includes pay records from the University of Texas, but not yet from Texas A&M University (we'll add their coaches to the list when we have the records), and from the UT and Texas A&M Systems. We're still adding databases (and you can send suggestions) as our various public information requests are fulfilled.